-1- Trip? What big trip? -3- "Where is my new blue and white blouse? Did Anne go through the laundry basket again?!" ...I have to pack. :-\ And to sum it up, I make packing WAY more complicated than it needs to be. I like to have options for outfits, dependent upon venue, weather, and a number of other factors that make sense only to me. I wanted to pack a dress to wear to Mass and dinner, and workout clothes, because we're taking some sort of fun class together. And then there's...well, you get the picture. -4- "This lotion bottle isn't labeled. Do you think it's under 3.4 ounces?!" -5- "I don't trust any of you people!" I prefer not to check a bag. ;-) I could bring as much lotion as I wanted if only I had a checked bag to tuck it into. But instead, I insist on stuffing everything into my cute orange carry-on sized rolling bag so that I don't have to worry about anything getting lost. I like knowing with 100% certainty that all of my carefully packed stuff will be with me when I arrive at my destination. Thus, the obsessing over toiletry sizes. Alas. 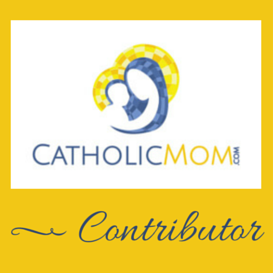 -6- "I'm just going to listen to my soothing podcasts and/or squeeze my eyes shut to pray a rosary the whole time." I'm a nervous flyer, it is true. And I checked in for my flight this morning and got a look at the planes assigned to my flights. I kind of knew this would be the case, since I'm taking a short, nonstop flight of under 2 hours. And so the planes are, you know, LITTLE. Smaller than the traditionally sized passenger jets. The smaller the airplane, the more anxiety-ridden your Catholic Librarian becomes. I haven't flown in one of these tiny death traps planes in quite some time. I'm making light of it, but this is a serious fear. Prayers? -7- "Ma'am, would you like a bag of peanuts? Oh, are you OK?!" Indeed, I abstain from all snacks on these tiny flights. :) I never feel well when I fly on them, and so I stick my nose in my book and hope that it will all be over soon. And luckily, the flights are short. And indeed, the result is SO WORTH IT! I'll be back to posting on the blog on Wednesday. The chaplet project is moving along *swimmingly* BTW, and I'm hoping to have news on that towards the end of next week. Until then, love to you all, dear readers! 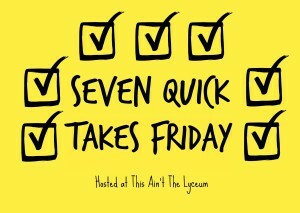 Head to This Ain't the Lyceum for more 7 Quick Takes! I've heard that smaller planes are less likely to have a problem with turbulence because they are able to fly around storms, etc. easier than big planes. Maybe that will help you feel better about it?? My fear of flying has also gotten worse as I have gotten older, and I decided after my last flight a few years ago that I will not fly unmedicated ever again. I'm a nervous flyer, too. And I'm reading this on an airplane, waiting for it to taxi to the gate. My hubby and I are on the road (again! ), visiting 4 of our 5 boys over the next two weeks--and all 5 of our grandkids! Because of those precious people, I fly in spite of my fear! Hi Laura! Glad to know that I'm not alone. :) And yep, it's the reason I fly too. The people are worth it! :) Have a safe flight!